We are the leading and prominent Manufacturer and Exporter of PTFE Elbow. We are offering PTFE Lined Elbow to our clients. Lined Elbow, offered by us, is manufactured from the premium raw materials using advanced technology machines. They are available in varied dimensions to meet the different requirements of the clients. Easy to install, our range of Lined Elbow is sure to provide long lasting excellent performance. Available in PTFE, PFA, FEP , PVDF , PP and HDPE materials. 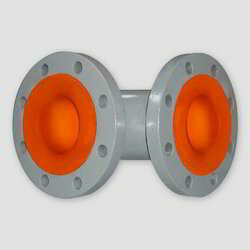 Description: PTFE Lined Carbon steel 90° & 45° Elbow F to F as per ASA 150# and Flange drilling as per customers requirements and specifications.